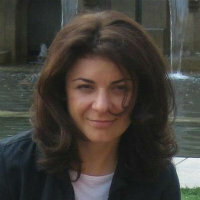 Linda Mitrojorgji is a PhD fellow in Management at Cass Business School, City University London. Her research focuses on the problem formulation process as part of decision making in organizations. She uses ethnography and other qualitative methods to offer a process model view of problem formulation as an opportunity and value creation process. She looks at creative industries, more specifically architectural practice, to better understand the problem formulation process in organizations, both at group and individual level. Prior to starting her PhD, Linda worked as an architect and urban planner at various European and US firms. She is a Fulbright Fellow and holds a Dual Master’s Degree in Architecture and Urban Planning from University of Illinois, Urbana- Champaign, USA. Albanian, English, French and Italian. Mitrojorgji, L. (2017). Problem formulation or problem creation? A process view of problem formulation as a value creating activity. University of Edinburgh, Edinburgh, UK: SAMS Doctoral and Early Career Faculty Paper Development Workshop on Creative Industries. Mitrojorgji, L., Fonti, F. and Vaillant, Y. (2016). Design for innovation: The influence of design methods and processes on idea generation and selection. Anaheim, CA, USA: Academy of Management Annual Meeting. Mitrojorgji, L., Fonti, F. and Vaillant, Y. (2015). Design for innovation: The influence of design methods and processes on idea generation and selection. Denver, CO, USA: Strategic Management Society (SMS) Conference.